Gutters can be a huge pain for a homeowner, climbing up on a ladder to dig out of all of the debris they’ve trapped, making sure they don’t get stopped up. With all of the work gutters can require, it’s easy to see why so many homeowners are left asking themselves, “Do I even really need gutters on my home?” In short, the answer is Yes. At John Beal Roofing, we’ve seen the chaos that poorly installed gutters can create and don’t wish that upon on any of our customers. So before you decide to tear them off of your roof in a fit of frustration, let’s talk a little about gutter installation and how it can protect your property from many problems down the road. There are a few different ways that gutters protect your residential property from the water damage caused by rain, snow, and ice. The first is by keeping water from coming through doorways, windows, and your building’s other openings. 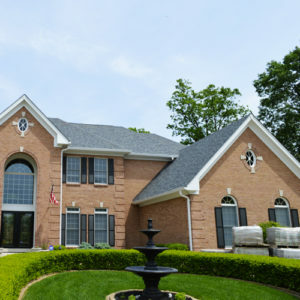 By funneling water away from your property, safely and efficiently, gutters ensure that you’re not going to one day open the front door, only to discover that your front lawn has recently been transformed into a functional swimming pool. If you can do a backstroke in your yard, it probably means your gutters were not installed properly and that it’s time to call John Beal Roofing! The other way that gutters benefit your home is by reducing soil erosion. All of the beautiful plants and flowers you’ve planted around your yard, all of that hard work, could end up swept away come the first significant rain. Gutters help protect your cherished perennials from getting flooded, averting that river somewhere safer. Even worse than losing your garden, soil erosion can also leave your property vulnerable to foundational damages. Just imagine sagging rooftops, cracked walls, and chimneys that tilt. These are all frightening images things that you, as a homeowner, will want to avoid. To prevent this, all you need to do is contact John Beal Roofing. In addition to gutters, properties that are surrounded by trees will want to consider having leaf guards installed. It’s a small addition to your gutters that can save you an abundance of time. Remember that chore you hate, where you nearly fall off three-stories off a ladder just because your gutters are packed with dead leaves and baby trees? Leaf guards provide a layer of protection from this junk, thereby reducing your chances of taking a nasty fall. Talk to your John Beal Roofing contractor about leaf guards, as well as types of gutters that may have this kind of protection built-in. If you’re ready to get your FREE estimate and learn what residential roofing solution is right for you, contact John Beal Roofing today!